Teaching children how to express their emotions in appropriate ways is possible. This does not mean that your child will never have a tantrum or behave in ways that frustrate you, but children are capable of learning how to express big emotions in ways that adults consider more appropriate. An article on Mama Smiles blog reviews ways to help teach children emotional intelligence. 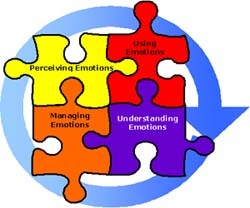 Emotional intelligence includes perceiving emotions (in ourselves and others) using emotions (ie to problem solve), understanding emotions, (ie understanding complicated emotions) and managing emotions. The article discusses 4 ways to help children increase their emotional intelligence which will in turn increase their ability to understand and manage their emotions. These include: pretend play, family time, picture books, and labeling emotions. In previous posts I have discussed the importance of play for children and I believe emotional intelligence is a big one. Pretend play allows children to process their feelings much like adults use talking to process feelings. Family time allows for modeling of how caregivers deal with emotions. As parents, it’s important to model for children what we want to see them doing. I think this can be very hard as nobody is perfect, but definitely an important thing to remember as we interact with our children and try to handle our own feelings throughout the day. Children’s books cover a range of topics from defiance to death and can help children understand how to manage such things. Labeling emotions helps children define what it is they are feeling. As adults we know when we have a feeling that it is called anger or sadness or anxiety, but children are building their vocabulary and it is important that it include feelings words. Using a feelings chart or stating “you are really angry right now” are ways to help a child begin to put a name to their feelings. The idea is once children are able to put a name to their emotion they can use that rather than acting out (“I’m mad” vs. stomping on the floor).